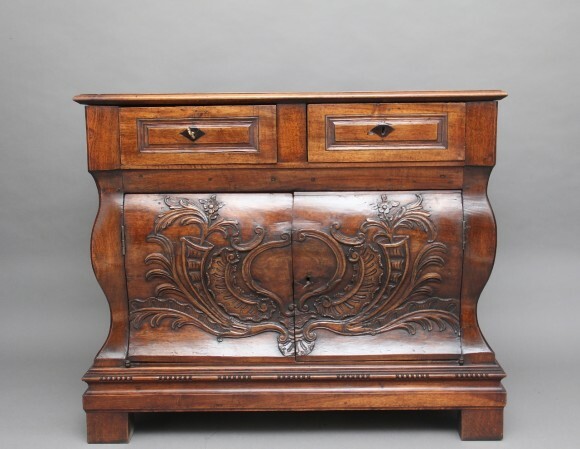 An unusual and rare 18th Century French walnut Bombay commode, the thumb moulded edge above two large drawers with original locks, and moulded drawer fronts, two shaped cupboard doors below opening to reveal a fixed single shelf inside, the door fronts having lovely crisp carving of floral decoration, with further carving of shells on both sides of the commode, the bottom of the commode having carved bead decoration running along the sides and front, supported on block feet. Fantastic condition and in great condition. Circa 1770.